The EEC High-Speed Bio-Tec biodegradation and sedimentation technology is unique due to its compactness and performance in respect to volumetric efficiency. These technologies are combined in a prefabricated, skid mounted and standardized tank system with variable lengths, suitable for overseas transportation in ISO freight containers. 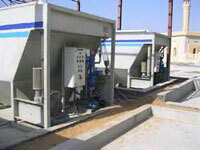 The systems are fully automatic, ready to be operated, and no odor. A suspended, free floating biofilm carrier medium provides a large, protected biofilm surface and simultaneously accumulates the active biosludge inside the reactors. The biodegraded water flows into a clarification stage where the suspended solids settles by gravity. The water is directed through a skim well to a settler system which provides the final clarification of the effluent For systems with high cleaning efficiency. 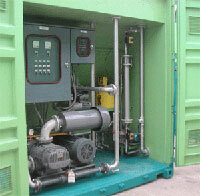 EEC can configure package systems to meet your exact requirements including Ammonia and Nutrient removal. Want to know more, enter here >>> Animated flow & More. EEC has more than 25 systems with the US Military alone and hundreds of systems installed all over the world. We design our WWTP so we can meet any effluent requirements including ammonia and nutrient removal if required. With decades of hands on experience, we are considered one of the preferred leaders when it comes to Package Plants for Wastewater, our client list speaks for itself. 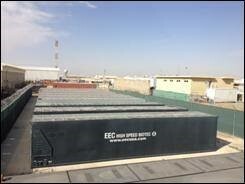 EEC offers production from several locations around the world. EEC - Domestic Wastewater / Standard Capacity.